Kathryn Greeley, owner of Kathryn Greeley Designs, has been providing professional interior design services for elegant lifestyles in the Southeast for more than thirty years. 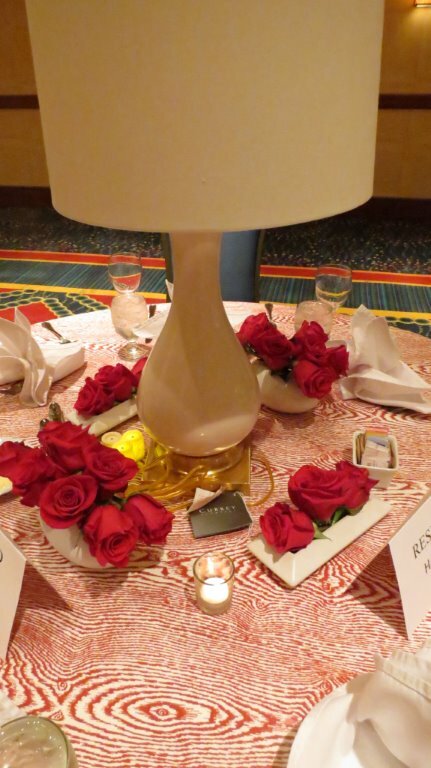 Last week at the Women’s Leadership Development Network Conference, Kathryn created stunning tablescapes for the Annual Appreciation dinner WithIt held at the Buckhead Marriott in Atlanta. 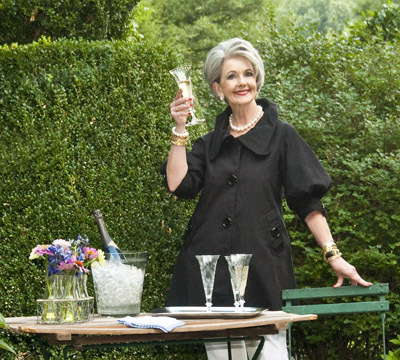 Join us as Kathryn takes you on a tour filled with her gracious, Southern style. View Kathryn’s design work on her website. Wow, what a great time I had with the WithIt group at their annual conference in Atlanta. I met lots of new people in our industry and also had a chance to visit with old friends. 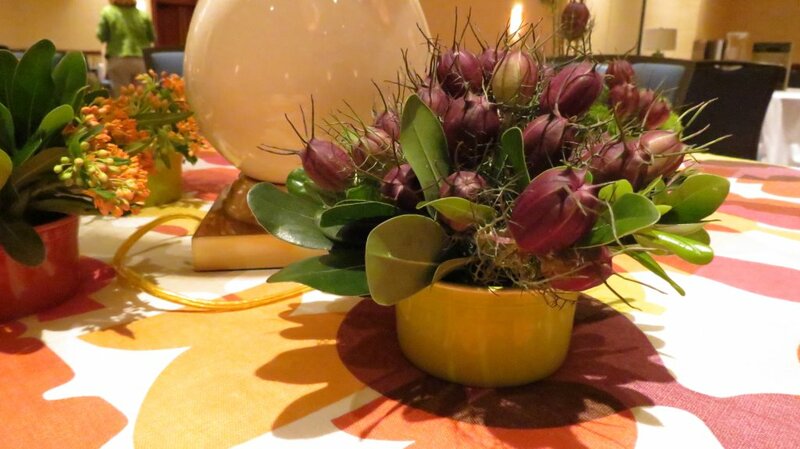 On Tuesday, I did all of my flowers for tablescapes using the generous product donations from Currey & Company. 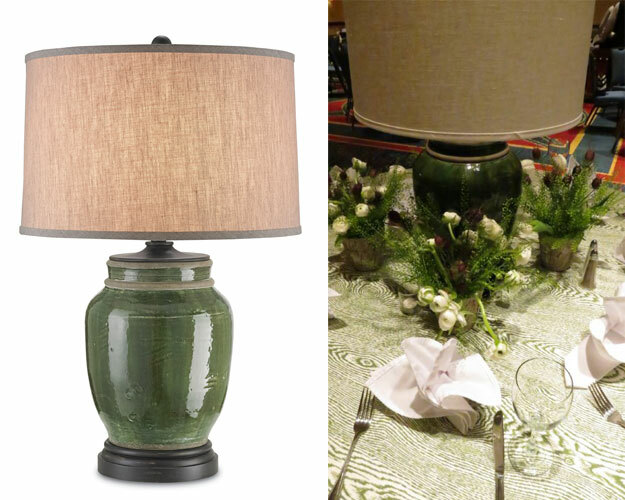 It was so fun pairing their lamp and accessory donations with tablecloths and flower containers that I already owned. 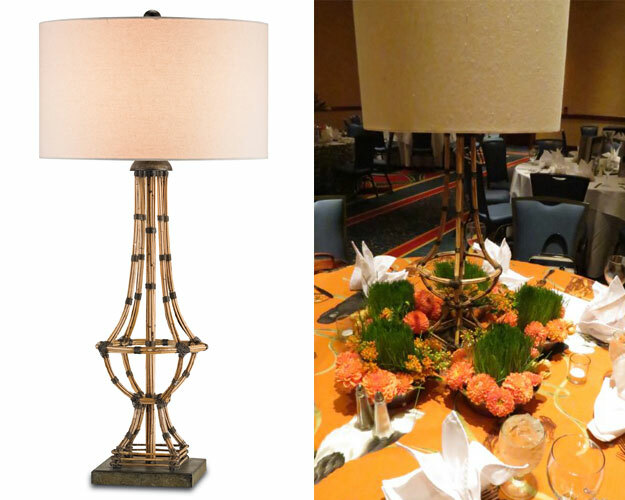 As I said earlier this week, I have never designed banquet tablescapes with lamps! But who could resist these lovely Currey products. The hit of the tables seemed to be my “dog” table. I started with a great tablecloth I made several years ago from a Kravet fabric. To this I added the Palm Beach lamp from Currey. 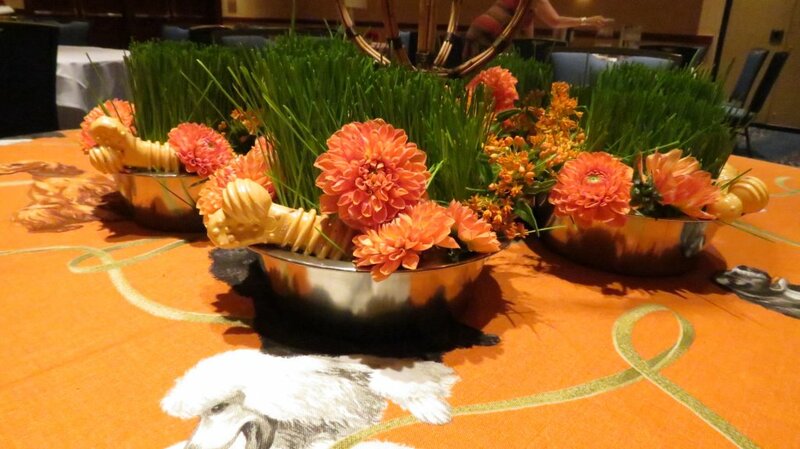 I did five little flower arrangements in dog bowls, using wheat grass, dahlias, and dog bones! You know that I have a very soft place in my heart for our furry –four legged friends, as did so many of the WithIt attendees! I think the second favorite table was one with a green faux bois fabric from Brunswhig and Fils. 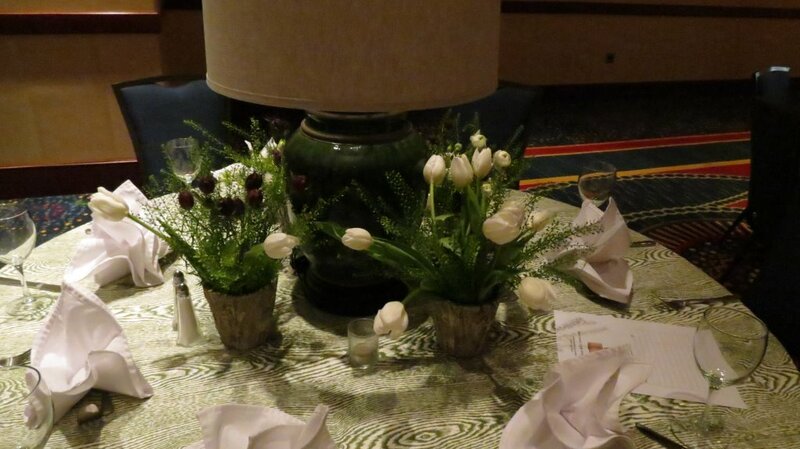 Atop this cloth I used the Carver White lamp and small faux bois pots filled with greens , white ranunculus, and white tulips. I bid on this lamp, but sadly didn’t get it! I am quiet fond of this tablecloth that was fabricated with another Kravet fabric called “Pots”. 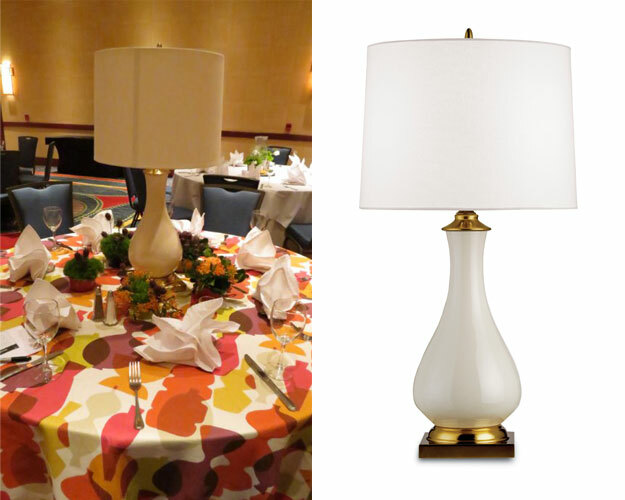 It is so fun and the white Currey Lynton lamp was a nice contrast to all of the color and pattern. Currey generously gave a pair of these lamps!! I used some small reproduction fiesta ware bowls in a variety of colors and filled them with different flowers. My favorite flowers on this table were these delightful little Nigella Pods. The texture and color are both so interesting. I did a second table with a red faux bois fabric and the other Lynton lamp. 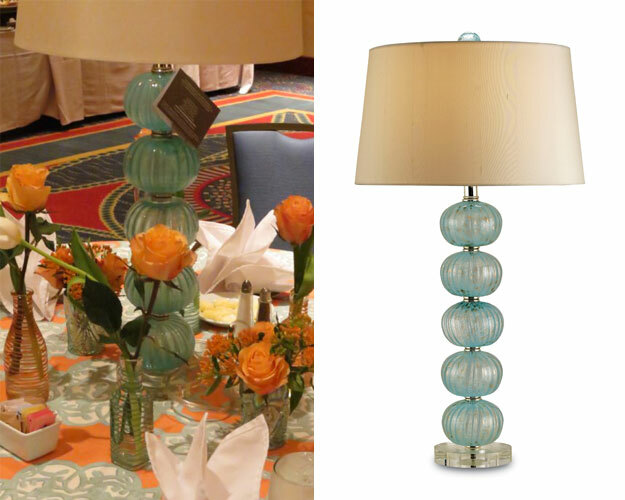 Another favorite of the Currey donations was a pair of these lovely aqua glass Asturias lamp. I used my aqua and peach tablecloth and a variety of small aqua and peach vases. 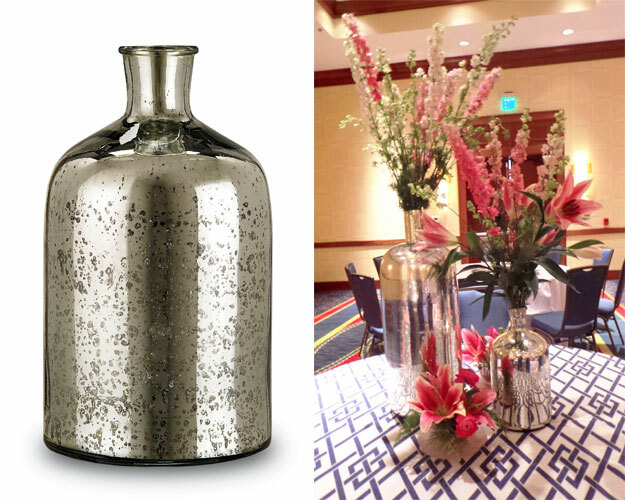 Currey also donated two beautiful mercury glass jars, “Cypriot Bottle” in small and large sizes that I placed on a navy trellis tablecloth. Deep pink flowers….larkspur, lilies, and ranunculus where such a pretty contrast to the silver colors in the glass. 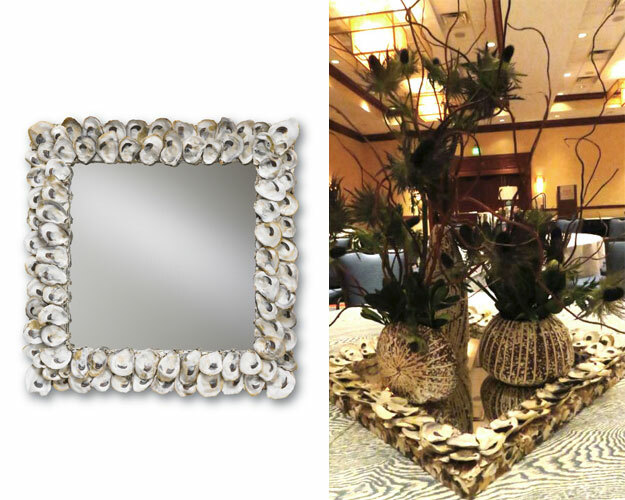 And last, but certainly not least was the oyster shell mirror donation. I thought a blue faux bois tablecloth would feel somewhat “beachy” and the texture of the shellflower containers was perfect for willow and thistle! I would like to go on record regarding my photography skills in a big, heavily patterned, brightly lit ballroom…. well I think you can draw you own conclusion quiet easily!!! But I believe all of you are creative and can see the “method behind the madness”! Never let it be said that one can’t create tablescapes out of lamps! Thank you so very much Bethanne and Currey for the opportunity to be a part of this fun leadership conference. And congratulations to Withit for raising approximately $9000.oo on this auction! And also thanks to Currey for buying ten copies of The Collected Tabletop to put in the auction, along with their products. The Collected Tabletop thought it was in great company on Tuesday evening! As her parting shot, Kathryn Greeley says “Enjoy!” We’d like to thank her very much for including our products in her beautiful tabletop tableaux. This entry was posted in Currey & Company, Entertaining, Products and tagged Accessories, design influencers, design trends, Events, Floral, Garden, glass, Lighting, mirrors, nautical, Oyster Shell, seashell, Silver, Table Lamp, tabletop, White on August 19, 2014 by Currey & Company.